This article shows you how to use this section to set email notifications to be sent when the backup is finished. There are three types of email notifications depending on the backup status: success, warning and error email notifications. In order to enable email notifications, you have to go to File -> Options -> Email and check the Enable email notifications option. You'll have to enter the email sending server settings and test those in order to be sure that emails can be sent. 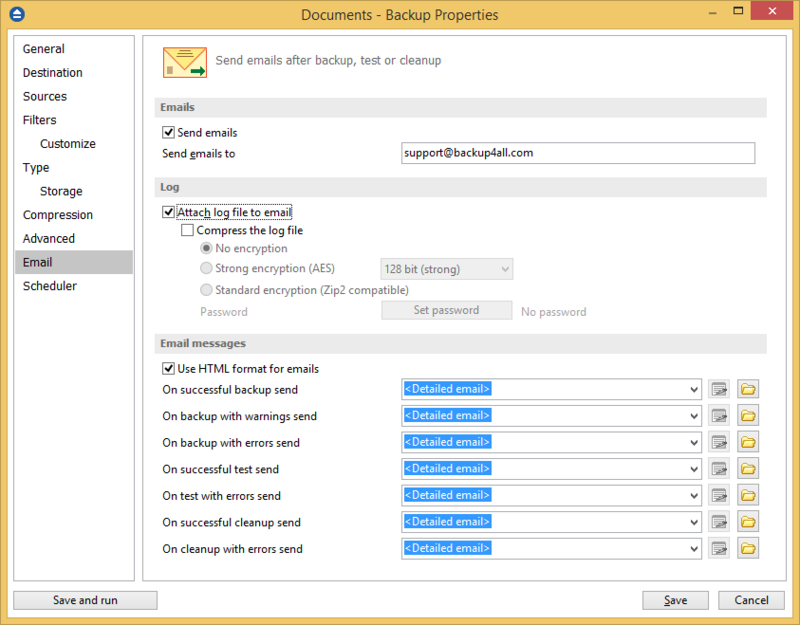 Once that option is set, you can configure email sending individually for any backup job. Just right-click on a backup job, go to Properties and Email. This will open an email settings window with several options. On the email settings page, check the Send emails option and then enter the email addresses you want the notifications sent to in the Send emails to field. You can enter multiple email addresses separated by comma. The notification emails will be sent at the end of the backup, test or cleanup operation to the specified emails. If the Attach log file to email option is checked, the backup log file will be attached to the email. No encryption. The zipped log file created will not protected by password for unauthorized access. Zip(2) compatible encryption. This is the standard Zip 2.0 encryption: an older encryption technique that provides relatively weak security compared to AES encryption. Zip 2.0 encryption format cannot provide protection from individuals with access to specialized password recovery tools. Its advantage over AES encryption is the compatibility with all third party zip applications. 128 bit (strong) - size of the encryption key is 128 bits. This provides significantly better security than standard zip 2.0 encryption. 192 bit (stronger) - size of the encryption key is 192 bits. 256 bit (strongest) - size of the encryption key is 256 bits. This is the strongest encryption method for zipped log file and it provides the best security. If encryption is enabled you'll have to Set the password that will be required when unzipping. Note: Backup4all does not store passwords. Make sure that you remember the password used, or you will not be able to extract the log file. The Email messages section allows you to configure individual emails that will be sent after the backup job finishes, depending on its status. By default Backup4all will send a Detailed email with information on the backup job, but you can also create your own email template and use it instead. The default email is <Detailed email>, but you can pick one that you created by clicking the Browse button. The Edit is enabled only if you are using a custom email template created by you (doesn't work with the default email). If you don't want an email to be sent for a job status, just select <No email> from the drop-down of that notification field. On successful backup send. This is the email that will be sent when the backup is finished with success. On backup with warnings send. Email that will be sent when the backup is finished with warnings. On backup with errors send. Email that will be sent when the backup has failed because of an error. On successful test send. Indicates the email that will be sent when the test operation is finished with success. On test with errors send. The email that will be sent when the test operation failed because of an error. On successful cleanup send. Email that will be sent when the cleanup operation is finished with success. On cleanup with error send. Email that will be sent when the cleanup operation failed because of an error. For an example of tag usage, open one of the 5 default emails. The emails are stored in text format in application's directory (i.e. C:\\Program Files\Softland\Backup4all 7\) with the following filenames: SuccessFullEmail.txt, WarningFullEmail.txt, ErrorFullEmail.txt for backup emails, TestSuccessFullEmail.txt and TestErrorFullEmail.txt for test emails. Cleanup for backup job <#BACKUP_NAME> at <#CLEANUP_START_TIME> finished successfully. See log file <#LAST_LOG_NAME> for more information.